To date, three events have taken place. Thus far, the events have brought together people from diverse sectors of the food system: farmers, community members (including those who make use of food assistance programs), state employees, University of Minnesota Extension staff, food system advocates and organizers, grocers, state legislators, county commissioners, at least one beekeeper, and more! So far, nearly 300 people have attended these events. Imagine how many people will have contributed to our regional conversations once all nine are completed! South Central’s “Chew and Chat” event was held in Sherburn at a restaurant called Cup ‘N Saucer, an eatery that works to get as many locally-sourced foods and ingredients as possible for the meals they serve. While I was impressed with much during our time together, the ending segment really impressed me. The final 30 minutes were devoted to the whole group sharing what we each talked about over lunch. At every pause, many hands were raised as people from each of the tables wanted to offer up the conversations that surfaced within their groups. Next up was Central Minnesota’s event, held at St. Cloud Technical & Community College. Three items, in particular, had me giddy. First, they far exceeded their attendance goal of 50 people—bringing together roughly 85 people from across the region. Next, the lineup of speakers—which included a representative from the faith community, an advocate representing the low-income community, a local grocer, a food hub operator, and a culturally-appropriate food advocate—inspired many questions from the audience and challenged everyone to work together moving forward. And most important, I saw plenty of people networking before the event began and during the lunchtime activity. And lastly, thus far, was the Northwest region’s “The Future of Food” event, which devoted a majority of its time to group activities focused on food system core values (e.g. supports and enhances the quality of life for all citizens), actions, and who was missing from the conversation. Approximately 150 gathered for this highly interactive event. The event also bestowed its first Cass Clay Food Champion of the Year. Now known as “the chicken lady,” Kim Lipetzky was instrumental in the passage of a backyard chicken ordinance in Fargo, North Dakota. Later today I’m off to join West Central’s event at the University of Minnesota’s Morris campus with five more events scheduled for later this week and in early December. I look forward to just as much knowledge and passion directed at how we get reliable access to healthy, safe, and affordable food to communities across the state. You can find your local event here. 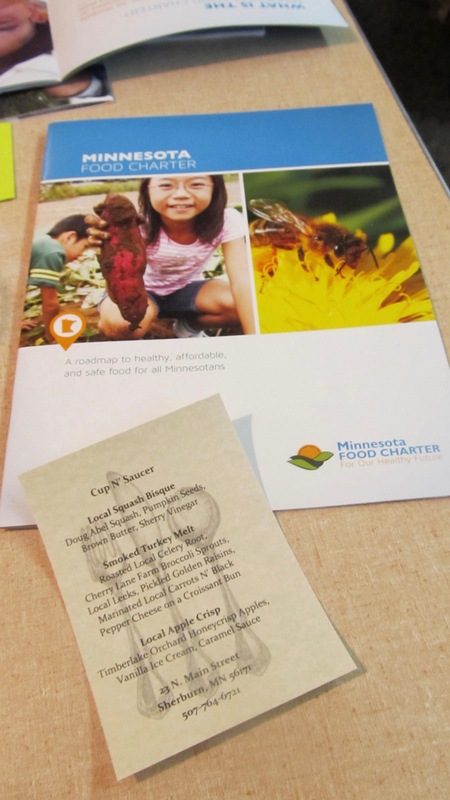 Next month I’ll provide an update on the entire Regional Food Charter in Action series.